For decades, crucial documents relating to accession of princely states to join India had been locked away in government files. But no longer. For months, RTI campaigner and programme coordinator with the Commonwealth human rights initiative, Venkatesh Nayak, had been trying to obtain the documents of accession of 540 princely states. He had even filed an RTI with the home Ministry, which finally transferred his petition to the National archives. Recently, the national archives gave him permission to take copies of these documents. "The accession of J&K is a fact of history known to all of us, but for the first time , citizens can look at the actual document," Mr Nayak said. 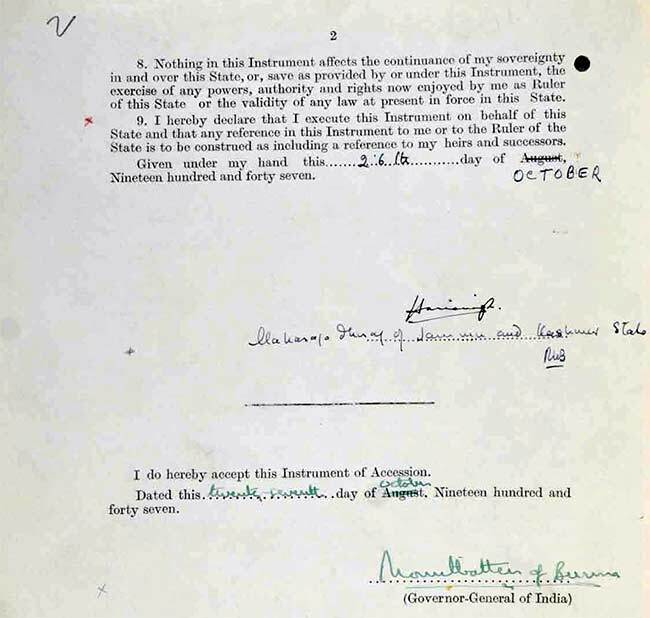 The ruler of Jammu and Kashmir, Maharaja Hari Singh, had acceded to India on October 26, 1947, by signing the "instrument of accession" like other princely states. "I have not seen this document in decades and it brings with it a flood of emotions," Dr Karan Singh, Rajya Sabha lawmaker and son of Maharaja Hari Singh, told NDTV. Dr Singh told NDTV that he recognized the document and the hand writing of his father. "Invaders from across the border in Pakistan had crossed over into J&K and were about to take over the airport. Had it not been for the bravery of the Maharaja's soldiers, the airport would have fallen, making it impossible to sign the document," Dr Singh told NDTV. The lawmaker said he hopes the document will silence critics from across the border, who had questioned its very existence. Interestingly even at the time of writing this news report, Pakistan's ministry of foreign affairs website have links to documents challenging the signing of this document, calling it a myth. Dr Karan Singh told NDTV that he was also present in his home on that day -- October 26, 1947, when his father, Maharaja Hari Singh, signed the instrument of accession. The document was sent along with a personal letter to Lord Mountbatten, who was the Governor General of India at the time. "This is an important page from India's history and it is wonderful that it is being preserved in the national archives for the public to see," Dr Singh said. Golden_Rule, Pundrick, nair and 6 others like this. PARIKRAMA and NKVD like this. Because he wanted to join India, his subjects Pakistan .... and his dilly-dallying the same left this to be signed in a hurry? Nehru got the document but did not act on it and allowed the state to be invaded and thence get a reason to finish Pakistan off forever sometime later in the history of two nations.....but unfortunately, he could not get the country up in time and died before realising his dream? I would love to have our friends from other place jump onto this one!!! On topic. It was always known that the document was in the National Archives. dadeechi and PARIKRAMA like this. What took it so long to come out in public domain? PARIKRAMA and Inactive like this. Seriously, I really do not understand what took so long ... and neither do I understand the need to keep engaging with Pakistan over it. Confounding stupidity? dadeechi, PARIKRAMA and scorpionx like this. The IoA was with the Home ministry till 2010, then transferred to NAI. As per the Assistant Director of NAI, the IoA was available for taking copies in 2012!! Then after four years finally this? It shows how lethargic we can be in documenting our own history, isn't? No body knows how many tons of such priceless historical documents are rotting in National Archives and historians have still no access to them. Levina, Inactive and PARIKRAMA like this. The present Government is following the Strategy of Conflict (work of Thomas Schelling) to the dot. Basically its using the reputation theory to resolve in order to cover its 2 prong strategy . "The reputation theory of conflict behavior claims that a state with an established practice of using force during crises and thus acquiring a strong reputation for resolve would enjoy bargaining leverages during future crises." Its the propaganda part of unveiling and publicizing the actual case of J&K accession theory and decimating all past false stories associated with it. This is basically the soft approach. This has to be seen coupled with long 100+days issues in J&K at present timelines which basically will mean the whole basis of this conflict was never there to begin with and all the last almost 7 decades was a false propaganda. The hard approach is publicizing and carryout the cross border raids and surgical strikes as and when the escalation happens. The hard approach. So what you see here is gradual removal of the term Strategic restraint from GOI's offensive and diplomatic option and moving more towards the reputation theory build up. Over time, GOI believes this will be more advantageous to its position to strike the bargain which strategic restraint failed to do so. Golden_Rule, Pundrick, Levina and 5 others like this. Matters related to Kashmir are murky enough that anything can be promoted as to the causes. But then, sunshine is the best disinfectant. A matter-of-fact detailed timeline leading up to the signing would be a good start. I am sure the record exists. BTW, this is the second time Nehru's actions have cropped up. Did he ask for a fraudulent map to be substituted including Aksai Chin in Kashmir? Did he also sit on the document for too long? Why? And please do not let that insanity invade this forum too. One lunatic asylum run by its inmates is enough, thank you. I think we will start this topic here. Will request @scorpionx who is in hover mode right now, to also chip in. Let us ask the in house expert @Joe Shearer to start a Kashmir 101 thread. You and he can start off and I will do the moderation part to keep the non-sense jingoistic crap out. scorpionx and VCheng like this. I hope we start with who drafted this Instrument of Accession and what happened to it from August to October? First, every prince was to have completed the document by August 15, 1947. In the specific case of Kashmir, the Kashmir Administration got into a Standstill Agreement with Pakistan, allowing business as usual (Pakistani Punjab was the main route to Srinagar, and the route via Gurdaspur was a rough-and-ready one). It also tried to do the same with India but India was suspicious about this move and asked a lot of questions. So there was no Standstill Agreement. In spite of having this agreement, Pakistan grew very impatient and sought to hurry things up by sending in the tribal raiders, under a Pakistani Brigadier. By then, western Jammu had already broken with the Maharaja's administration and was, for all practical purposes, free, as Azad Kashmir. The Maharaja's nerve broke and he asked for Indian military assistance. Patel, Nehru and Mountbatten all agreed that only if Kashmir acceded to India could military help be extended. 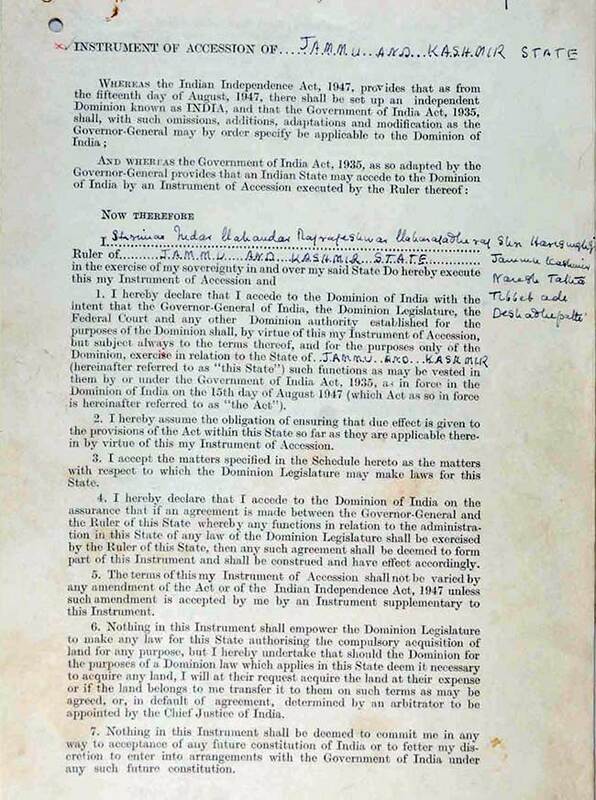 The beleaguered Maharaja agreed, and met a delegation of V. P. Menon and S. H F. J. Manekshaw at Srinagar, and signed this document. dadeechi and Inactive like this. Are you implying that the signature was made under duress? Inactive, PARIKRAMA and Joe Shearer like this.